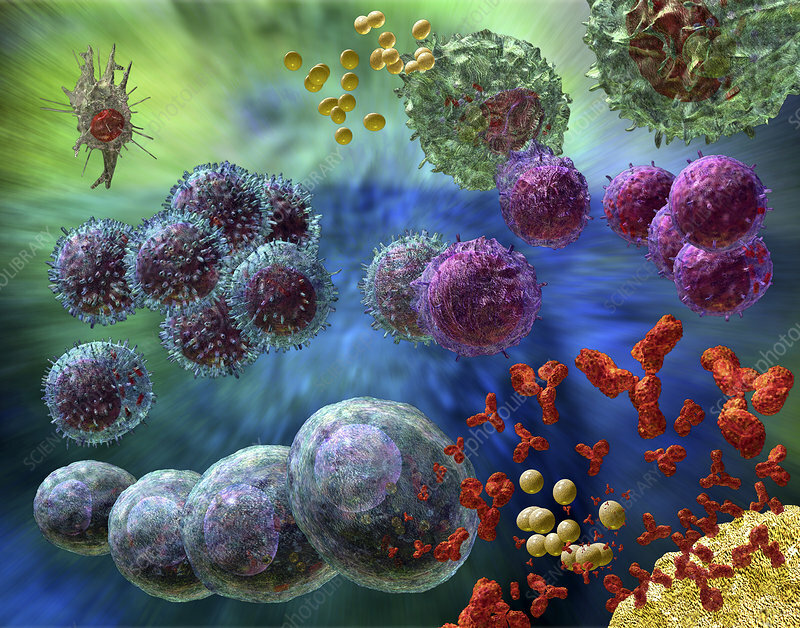 T cell dependent B cell activation, computer artwork. Invading pathogens (gold ovoids) are phagocytosed (engulfed) by macrophages, a type of white blood cell. Fragments of protein (antigen) from the pathogen are displayed on the macrophage's surface. The antigen is recognised by helper T lymphocytes (purple), which secrete chemicals to activate other immune cells, including B lymphocytes (blue spiky cells). The B lymphocytes differentiate into plasma cells (large blue cells), which produce large numbers of antibodies (red) that recognise the antigen. The antibodies either neutralise the pathogen or flag it for destruction by other cells.